Infinity War star Tom Holland has been known to spoil movies for everybody, which now has extended to his fellow actors and a movie that he's not even in. 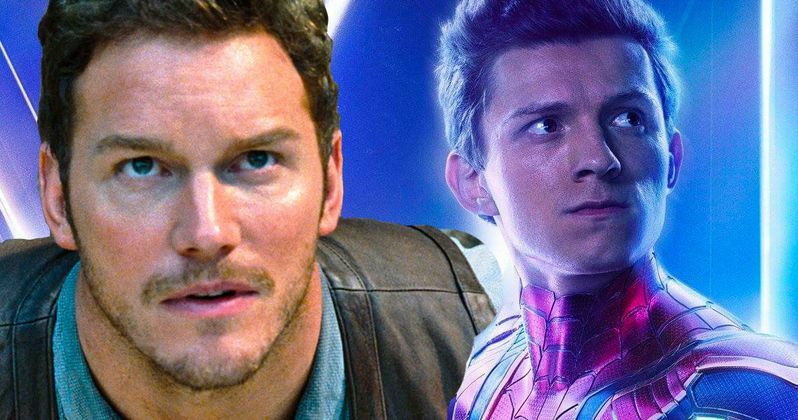 In a new interview, Chris Pratt, who starred alongside Holland in Infinity War, says that the Spider-Man actor spoiled Jurassic World 2 before he even read the script. Tom Holland just has a natural gift for freely sharing secrets with just about anybody who will listen or even to a sold out movie theater who are about to watch the movie he just blabbed about. To set up the story properly, Chris Pratt says that he spoke to Tom Holland while he was filming Guardians of the Galaxy Vol. 2. Holland was working on Spider-Man: Homecoming at the same time and came over to the Guardians set for a visit. Pratt notes that Holland already knew Jurassic World: Fallen Kingdom director J.A. Bayona from a previous movie, so he already had some dino intel. Pratt explains. "The first I heard about the plot was from Tom Holland, weirdly. I think I was shooting the sequel for Guardians of the Galaxy, maybe, and Tom was doing Spider-Man on the same lot. Tom, of course, knows (Fallen Kingdom director) J.A. Bayona because of the film The Impossible. Tom was the young guy in that movie... and he's so grown up now." Tom Holland walked up to Chris Pratt and started to discuss the plot of Jurassic World: Fallen Kingdom out of nowhere. As it turns out, J.A. Bayona made the rookie mistake of trusting a secret with Holland and let him in on the entire plot for the sequel before production had even begun. Bayona reportedly told him quite a bit since Pratt was shocked to learn that everything he said was true. Pratt had this to say. "He said, Hey mate, I just talked to J.A., mate, he told me the whole plot of the story, and I was like, What?' He said, Yeah, there's like a volcano, and I said, You're messing with me. He's like, No, mate, he told me the whole thing. So he told me the whole story, so I heard it right from Tom Holland first. And then, when I read the script, I was like, he wasn't messing with me. It was all real." Tom Holland has a long history with spoiling things for people and Chris Pratt's Jurassic World 2 story is just the tip of the iceberg. Back before Infinity War came out, he opened a package live on Instagram and leaked the first poster for the movie. That wasn't too bad since the poster was released soon thereafter, but he did ruin Infinity War in front of a sold out crowd in Los Angeles on opening night, which led to a collective groan from the audience. Holland also let the cat out of the bag about Spider-Man: Homecoming 2 long before it had ever been confirmed. We could be here all day and talk about everything that Tom Holland has spoiled over the last few years, but spoiling Jurassic World 2, a movie that he's not even in, before Chris Pratt even laid eyes on a script is some next level stuff. Holland truly has a gift, which has led to fake scripts being made for the projects that he's involved in, like Infinity War and Avengers 4. You can see what else Chris Pratt had to say about Tom Holland spoiling Jurassic World: Fallen Kingdom below, thanks to the Sirius/XM YouTube channel.